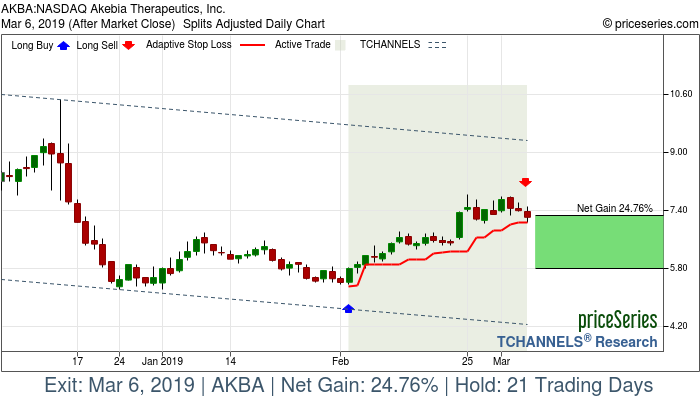 Akebia Therapeutics, Inc., a biopharmaceutical company, focuses on the development and commercialization of novel therapeutics to patients with kidney disease through hypoxia-inducible factor (HIF) biology. Its lead product candidate is vadadustat, an oral therapy, which is in Phase III development for the treatment of anemia related to chronic kidney disease in non-dialysis and dialysis patients. The company is also developing a HIF-based portfolio of product candidates that include AKB-6899 for the treatment of anemia; and AKB-5169, a preclinical compound for the treatment for inflammatory bowel disease. Akebia Therapeutics, Inc. has collaboration agreements with Otsuka Pharmaceutical Co. Ltd. for the development and commercialization of vadadustat in the United States, as well as with Mitsubishi Tanabe Pharma Corporation for the development and commercialization to vadadustat in Japan and other Asian countries. The company was founded in 2007 and is headquartered in Cambridge, Massachusetts.